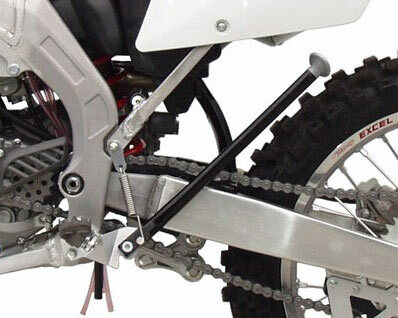 Bolt-on Kickstands - Pro Moto Billet has developed a frame mounted, internally sprung dirt bike kickstand that eliminates the worries of having an exposed spring fall off or get in the way of a rider's boot. 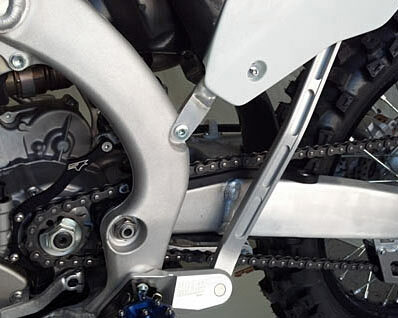 The Pro Moto Billet kickstand is a bolt-on installation using existing mounting locations, no drilling, tapping or inserts required! The entire motorcycle kickstand is CNC machined from 6061 billet aluminum and then clear hard anodized, for strength and durability. 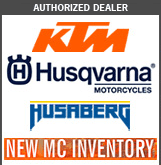 Durable, tough, and light, these side stands are specifically designed for riders, not showrooms, these motorcycle kickstands tuck neatly out of the way while riding. Strong enough to stand on while starting, Trail Tech kickstands feature pivot plates made from heat-treated Chromoly and kickstands made from heat-treated T-7075 aluminum for light weight, strength, and durability. All Trail Tech Kickstands are now shipping with black oxide coating.